This contemporary counter height dinette table adds sleek style with function for your kitchen or dining room. 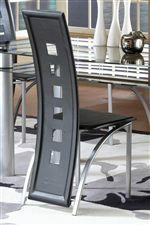 The table features a dark smoked glass top with unique shelf for bonus storage or display space for decorative accents. The chrome angled cylinder shaped legs complete this 42-inch by 42-inch square counter height table's sharp look with a futuristic flair. 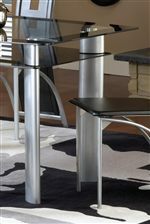 The Astro Smoked Glass Counter Height Pub Table - Black / Satin Silver by Bernards at Westrich Furniture & Appliances in the Delphos, Lima, Van Wert, Ottawa, and Celina area. Product availability may vary. Contact us for the most current availability on this product. The Astro collection is a great option if you are looking for Contemporary furniture in the Delphos, Lima, Van Wert, Ottawa, and Celina area. Browse other items in the Astro collection from Westrich Furniture & Appliances in the Delphos, Lima, Van Wert, Ottawa, and Celina area.